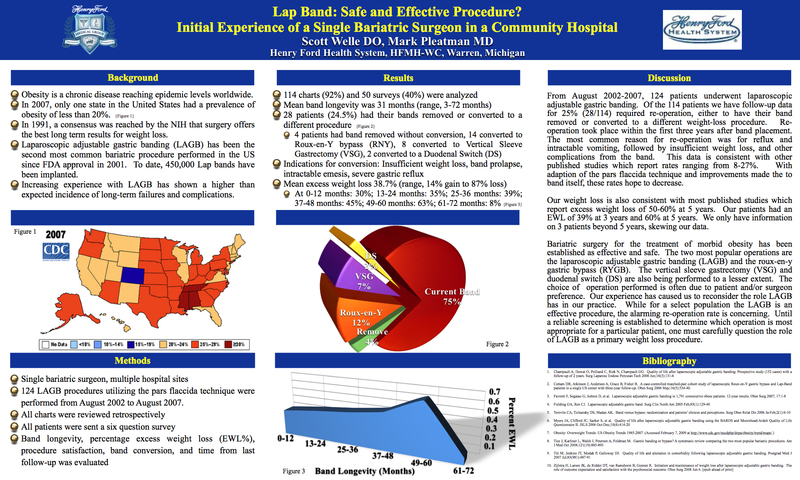 Lap Band: Safe and Effective Procedure? Background: The laparoscopic adjustable gastric band (LAGB) is the most commonly performed operation for weight loss worldwide. The Lap-Band was approved for use in the United States in 2001. LAGB has been described as a safe and effective weight loss procedure. Since then, however, insufficient weight loss and long term complications have been reported. Weight loss success and Lap-band conversion rates were studied. Methods: From August 2002 to August 2007, 124 patients underwent LAGB. All procedures were performed by a single surgeon. All charts were retrospectively reviewed. All patients were sent a six question survey. Band longevity, percentage excess weight loss, procedure satisfaction on a 5 point scale, number of conversion procedures, and time from last follow-up was evaluated. Results: Data from 114 charts (92%) and 50 surveys (40%) were analyzed. Mean band longevity was 31 months (range, 3-72 months). Mean excess weight loss 38.7% (range, 14% gain to 87% loss). Mean patient satisfaction with the procedure 3.1. The most common complaints being reflux, and sensation of “food getting stuck.” Mean time from last follow-up was 28 months (range, 1-60 months). Twenty-eight patients (24.5%) had their band removed with or without conversion to another weight reduction procedure. Four patients had the band removed without conversion, 2 converted to the duodenal switch, 8 converted to a vertical sleeve gastrectomy, 14 converted to a Roux-en-Y gastric bypass. Indications for conversion included insufficient weight loss, band prolapse, intolerance of band due to intractable emesis or severe reflux. Conclusion: Our study calls into question the safety, efficacy, and suitability of LAGB as a primary weight loss procedure.